Perfect for a warm summer evening, this Lentil, Grape and Radicchio Salad hit the spot for a light dinner. I thought MaMa had fallen off her rocker when she started pulling the ingredients for this salad out of the fridge and cupboards, but it turns out, even I, at three years old thought this salad was scrumptious. It all started when the fine folks at Royal Rose sent MaMa and I a cooler full of their tastey Radicchio. I could see the gears in MaMa's head start to turn. 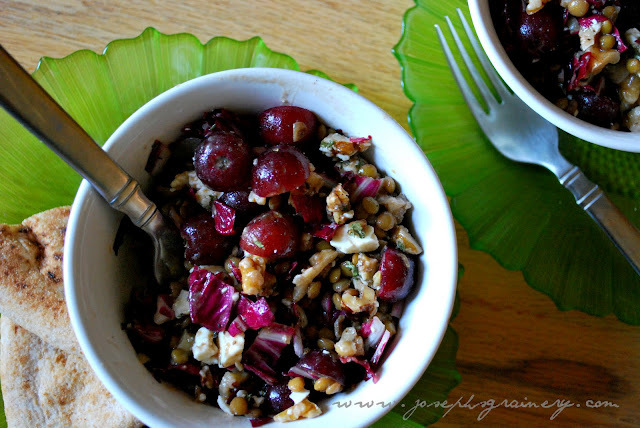 She was determined to come up with a recipe that would deliciously pair our whole grains (or as it turned out, our lentils) and Royal Rose's Radicchio. 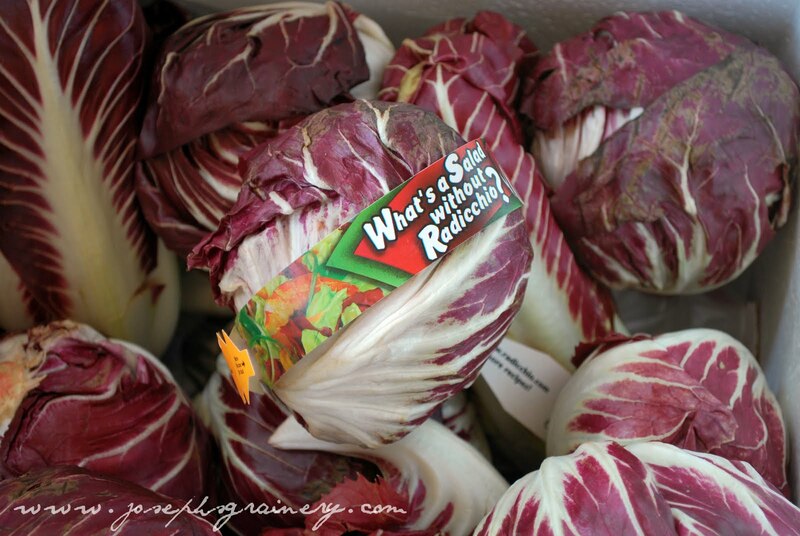 Unfamiliar with radicchio? I was when it showed up at our house. MaMa was a little concerned that I was more excited about the box it came in, but then again, I am three years old. I now know that I should expect something delicious when MaMa pulls a radicchio out of the fridge. There are a few different varietals of radicchio. MaMa used Radicchio di Chiagga for this salad, as it's known for it's sharp flavor that's pleasantly bitter. If you're looking for a salad with a lively combination of flavors, then this one's for you! Directions: In a small saucepan, bring 2 1/2 c of water to a boil. Add the lentils, reduce heat, cover and let simmer for about 30 minutes, or until the lentils are tender. Drain and rinse under cool water. While the lentils are cooking, in a large bowl whisk together the vinegar, lemon juice, and olive oil. Once the lentils have finished cooking, stir them into this dressing, along with the walnuts, grapes, radicchio, parsley and feta. Season to taste with salt and pepper. Serve along side a main dish, or let it be the feature...either way, you'll thoroughly enjoy it!